February 13 is the 44th day of the year in the Gregorian calendar.There are 321 days remaining until the end of the year(322 in leap years). 962 – Emperor Otto I and Pope John XII co-sign the Diploma Ottonianum , recognizing John as ruler of Rome. 1849 – The delegation headed by Metropolitan bishop Andrei Șaguna hands out to the Emperor Franz Joseph I of Austria the General Petition of Romanian leaders in Transylvania, Banat and Bukovina , which demands that the Romanian nation be recognized. 2004 – The Harvard–Smithsonian Center for Astrophysics announces the discovery of the universe's largest known diamond, white dwarf star BPM 37093 . Astronomers named this star "Lucy" after The Beatles' song "Lucy in the Sky with Diamonds". Guo Wei (郭威), also known by his temple name Taizu (太祖), was the founding emperor of imperial China's short-lived Later Zhou during the Five Dynasties and Ten Kingdoms period, reigning from 951 until his death. 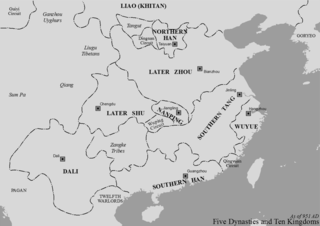 The Later Zhou was the last in a succession of five dynasties that controlled most of northern China during the Five Dynasties and Ten Kingdoms period, which lasted from 907 to 960 and bridged the gap between the Tang Dynasty and the Song Dynasty. Hartmann Schedel was a German physician, humanist, historian, and one of the first cartographers to use the printing press. He was born and died in Nuremberg. Matheolus Perusinus served as his tutor. Year 106 (CVI) was a common year starting on Thursday of the Julian calendar. At the time, it was known as the Year of the Consulship of Commodus and Civica. The denomination 106 for this year has been used since the early medieval period, when the Anno Domini calendar era became the prevalent method in Europe for naming years. Emperor He of Han was an emperor of the Chinese Han dynasty who ruled from 88 to 105. He was the 4th emperor of the Eastern Han. Saint Castor of Karden was a priest and hermit of the 4th century who is venerated as a saint by the Catholic Church. Castor was a pupil of Maximinus of Trier around 345 AD, and was ordained as a priest by Maximinus. Like his teacher, Castor may have come from the region of Aquitaine. At his ordination, Castor settled at Karden on the Moselle as a hermit with various companions, where they dedicated themselves to an ascetic life and established a small religious community. Saint Catherine de' Ricci, O.S.D., was an Italian Dominican Tertiary sister. She is believed to have had miraculous visions and corporeal encounters with Jesus, both with the infant Jesus and with the adult Jesus. She is said to have spontaneously bled with the wounds of the crucified Christ. She is venerated for her mystic visions and is honored as a saint by the Catholic Church. Saint Eormenhild is a 7th-century Anglo-Saxon saint venerated in the Eastern Orthodox and Roman Catholic churches. Absalom Jones was an African-American abolitionist and clergyman who became prominent in Philadelphia, Pennsylvania. Disappointed at racial discrimination in a local Methodist church, with Richard Allen, he founded the Free African Society, a mutual aid society for African Americans in the city. These included people newly freed from slavery after the American Revolutionary War. Blessed Beatrix d'Ornacieux was a Carthusian nun. Her feast day is 13 February. ↑ Edmund Goldsmid (1885). The Massacre of Glencoe: 13th of February 1692. Being a Reprint of a Contemporary Account of that Ruthless Butchery. E & G. Goldsmid. ↑ "Rachel Reeves: 'I look at the life choices Ed Miliband's made and do not envy that'". The Independent. 21 November 2011. Retrieved 12 February 2019. ↑ "American Beauty's Greek actor". Ellines. Retrieved 12 February 2019. ↑ "Eliaquim Mangala at 25: the day he was born..." Manchester City. 13 February 2016. Retrieved 12 February 2019. ↑ "Vitale Junior Roqica". Rugby League World Cup 2013. Retrieved 12 February 2019. ↑ Rafe de Crespigny (28 December 2006). A Biographical Dictionary of Later Han to the Three Kingdoms (23-220 AD). BRILL. pp. 531–. ISBN 978-90-474-1184-0. ↑ William Forbes Skene (1876). Celtic Scotland: A History of Ancient Alban. Edmonston & Douglas. pp. 308–. ↑ "Bonorum Possessio". uchicago.edu. Retrieved 2 October 2018. ↑ John (of Worcester) (1995). The Chronicle of John of Worcester. Clarendon Press. pp. 189–. ISBN 978-0-19-820702-3. ↑ Maria Hayward; Society of Antiquaries of London (2004). The 1542 Inventory of Whitehall: The Palace and Its Keeper. Illuminata Publishers for The Society of Antiquaries of London. ISBN 978-0-9547916-0-5. ↑ Heathcote, Tony (2002). The British Admirals of the Fleet 1734 – 1995. Pen & Sword. p. 249. ISBN 0-85052-835-6. ↑ "Malebranche, Andrée - Oxford Reference". doi:10.1093/acref/9780199935796.001.0001/acref-9780199935796-e-1282 . Retrieved 2018-05-11. (Subscription required (help)). Wikimedia Commons has media related to February 13 .